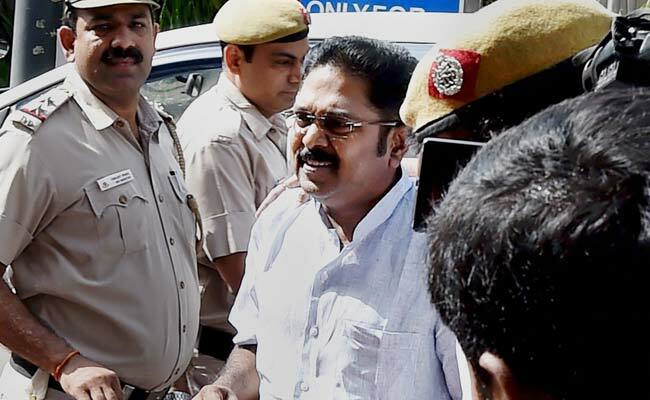 TTV Dinakaran had sought bail in a special court on Thursday. New Delhi: AIADMK (Amma) leader TTV Dinakaran and his aide Mallikarjun have been granted bail by a Delhi court for their alleged involvement in the Election Commission (EC) bribery case for the AIADMK's two leaves symbol. On Thursday, Mr Dinakaran had sought bail in a special court and said while he was booked for graft charges, no public servant was made an accused in the case. The Tis Hazari court granted bail to the duo, saying they were no longer required for custodial interrogation. They have been asked to furnish a personal bond of Rs 5 lakh each. The court also directed them not to try to influence the witnesses or tamper with evidence. They also have been asked to surrender their passports. They were also asked to join the investigation as and when required by the probe agency. The Delhi Police had earlier opposed alleged middleman Sukesh Chandrashekhar's bail plea, following which the court had reserved its order. The police claimed that there were many cases pending against Mr Chandrashekhar. The police also said that more arrests are likely to be made in the case soon. Mr Dinakaran, AIADMK's deputy general secretary, was arrested by the Delhi Police on April 25. He was questioned by the Crime Branch of the Delhi Police in the national capital for four consecutive days, for allegedly attempting to bribe Election Commission officials to allot his faction of the AIADMK, the party's two-leaf symbol, frozen by the poll panel after a dispute. Along with 53-year-old Mr Dinakaran, his friend Mallikarjuna was also arrested for sheltering Mr Dinakaran. The police says Mr Dinakaran had confessed to meeting Sukesh Chandrasekar, the middleman who was earlier arrested in the case. However, the AIADMK leader maintains that he did not pay any money to Mr Chandrasekar. Mr Chandrasekar was arrested from a Delhi hotel on April 16 allegedly with Rs 1.3 crore that was meant for bribing poll panel officials. He reportedly told the police he was Mr Dinakaran's "middleman" and was asked to pay the money to EC officials. Mr Chandrashekar and alleged hawala operator Nathu Singh are in judicial custody till June 12. Co-accused Lalit Kumar, who was also alleged to be a hawala operator, is in judicial custody till June 5. The court had on May 22 dismissed the bail plea of Mr Chandrashekar saying it was not appropriate to grant him bail at this stage as it was a serious crime and he could tamper with the evidence. Earlier, the police had sought the consent of Mr Dhinakaran and Mr Chandrashekar for taking voice samples but both of them had refused. The EC had frozen the AIADMK's symbol after two factions of the party -- one led by Mr Dinakaran's aunt Sasikala and the other by former Chief Minister O Panneerselvam -- staked claim to it.